I can’t believe we are in the home stretch to 2013. 2012 has passed way too fast for my liking. Looking back through the photos which have documented this year, I haven’t been baking or blogging about baking nearly enough. And though this has been a recurring sentiment, I’m getting back in the proverbial (blogging) saddle. Christmas is coming and the goose is getting fat. There’s going to be a whole lot of baking, eating, sharing and best of all a big trip to the motherland. 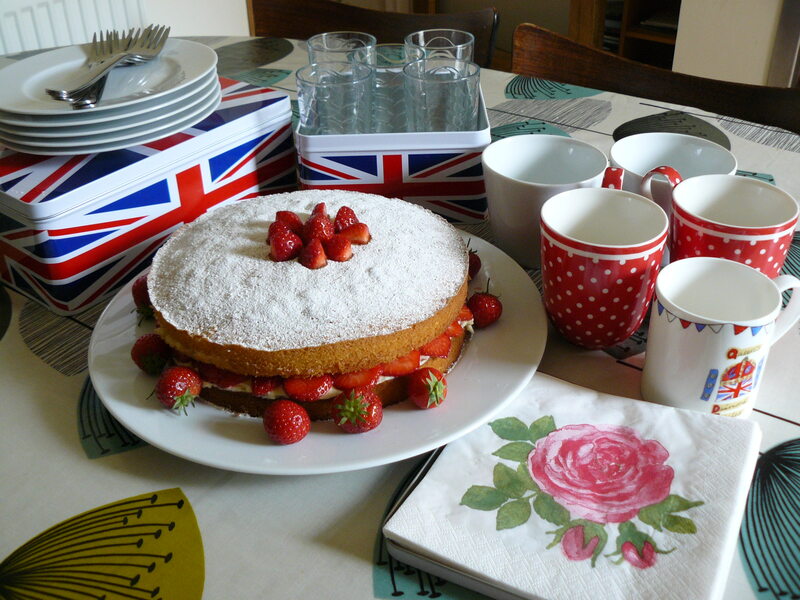 Victoria Sponge in honor of the Diamond Jubilee. Recipe from Primrose Bakery Baking Book, although I used fresh strawberries in place of jam and Earl Grey/Lemon whipping cream. This was my first go at the traditional British cake. I was happy with the way it turned out and will most likely bake it again when tradition calls. My baking book of the year is definitely ‘Baked In America‘ – maybe it’s because I’m American, but mostly because this is one AMAZING baking book. Recipes from this book are featured many times throughout the blog in 2012 and will continue to be featured in the future. 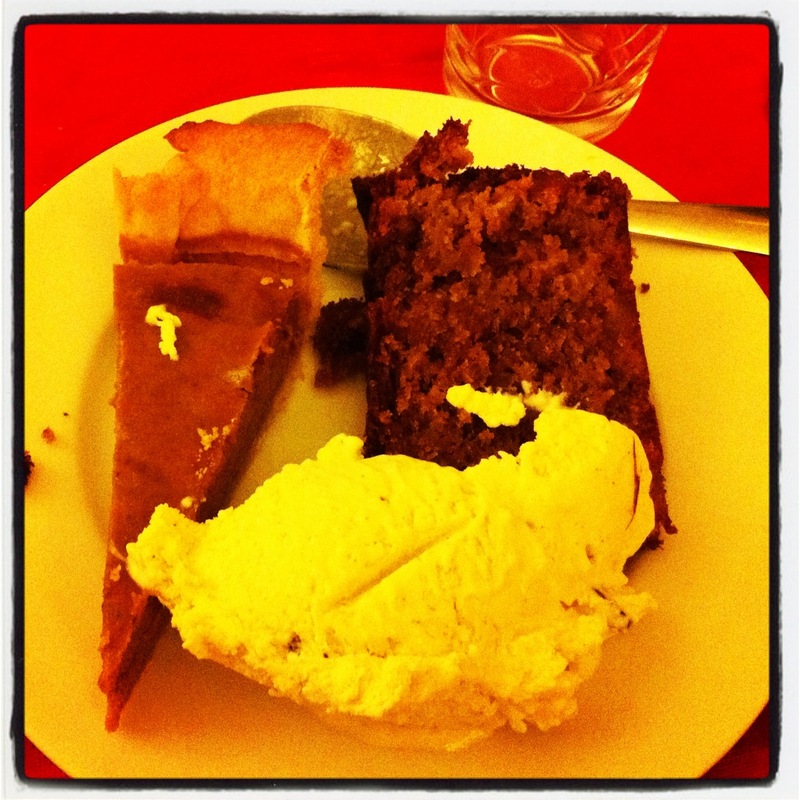 One day I’ll finally make it to Chiswick to Outsider Tart and hopefully meet my baking heroes – the two Davids. 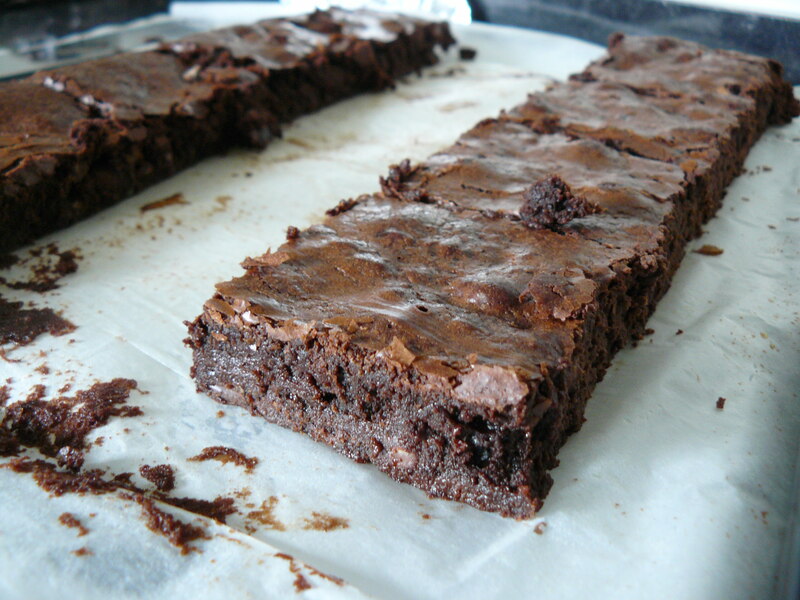 The brownies above are called Hepburns (Kate, rather than Audrey) and probably the best brownie recipe around. They make ideal treats for any occasion – school fetes, birthdays or general parties. These Chocolate Cherry Cheesecake Brownies were made especially for my mother in law’s un-birthday party. As her party food was served buffet-style, I wanted to make a special desserty treat that attendees could eat as little or as much as they like. 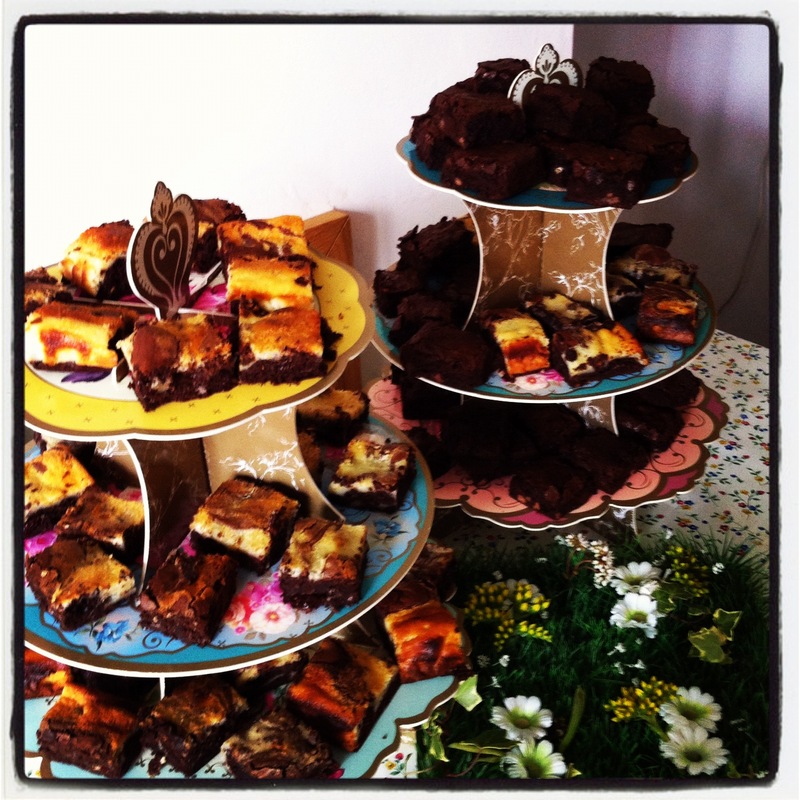 So these brownies were cut into 1.5 in squares and served on cake stands mixed with the Hepburns featured above. Another series of books which have inspired breakfasts, dinners and baking alike are the Leon books. 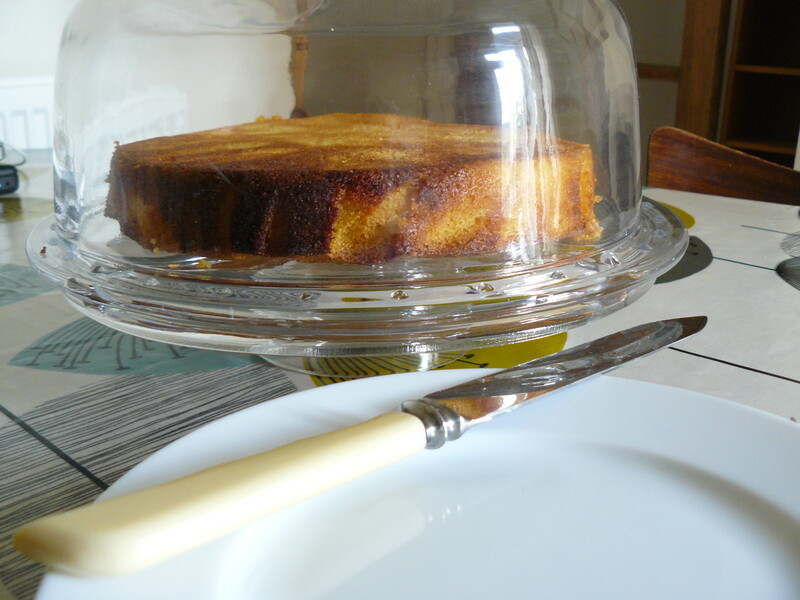 The Orange Polenta Cake is from Leon – Baking & Puddings, book three, as featured in the ‘Teatime’ section. This cake is an ideal accompaniment to Earl Grey tea and also gluten-free! Martin has been working on building a set of speakers over at his dad’s house. I like to take a baked treat when we go over. One weekend in September, Trish’s Two-Cents from Baked In America caught my eye and I had to give it a go. This is the best ‘pound-cake’ type cake I have ever had. It is definitely going to be in regular rotation for when cakes are called for. 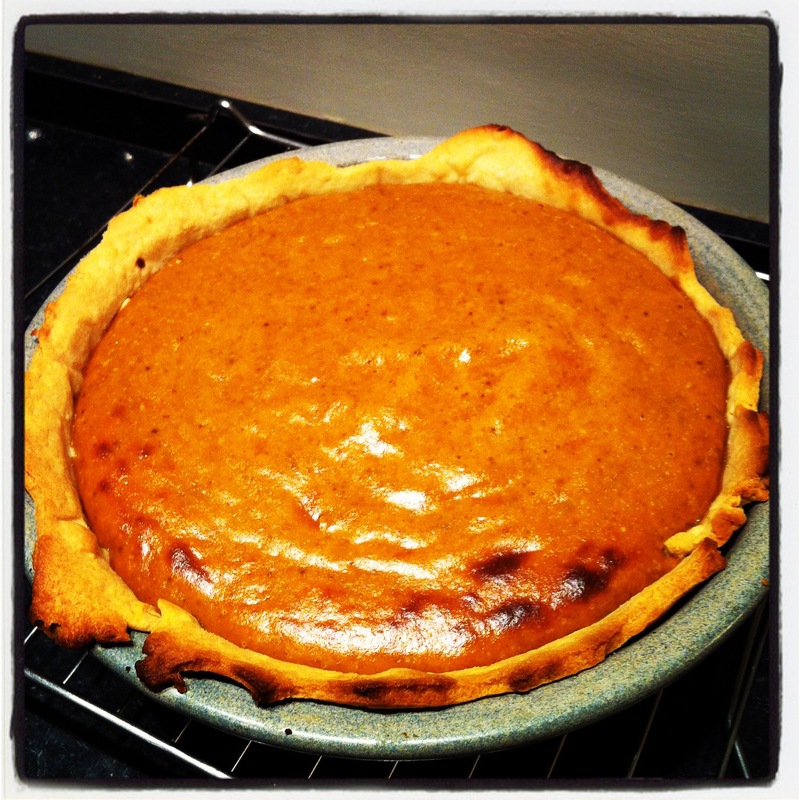 And last, but not least, in the baking recap is Pumpkin Pie. 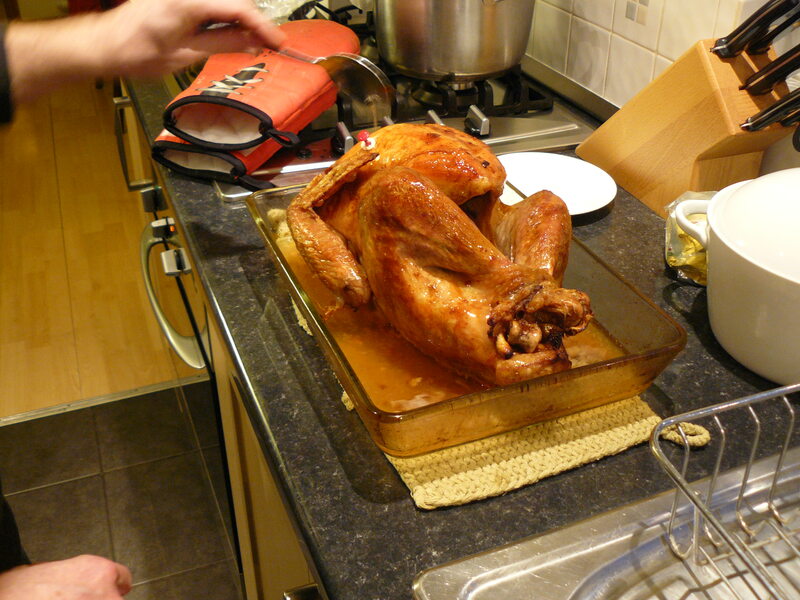 This is a recipe traditionally served at Thanksgiving, in fact was featured in my Thanksgiving blog post from 2011, but I am not celebrating Thanksgiving this year so it was moved to Bonfire Night. While this recipe is from the back of a Libbys can, it is home-made with love and reminds me of autumnal days past. Ok, in my head I’m singing Madonna’s ‘Holiday’. It has been about a year since I started this blog and I must say it has been quite a learning adventure. I’ve met a bunch of fantastic people and made some new (and very good) friends. 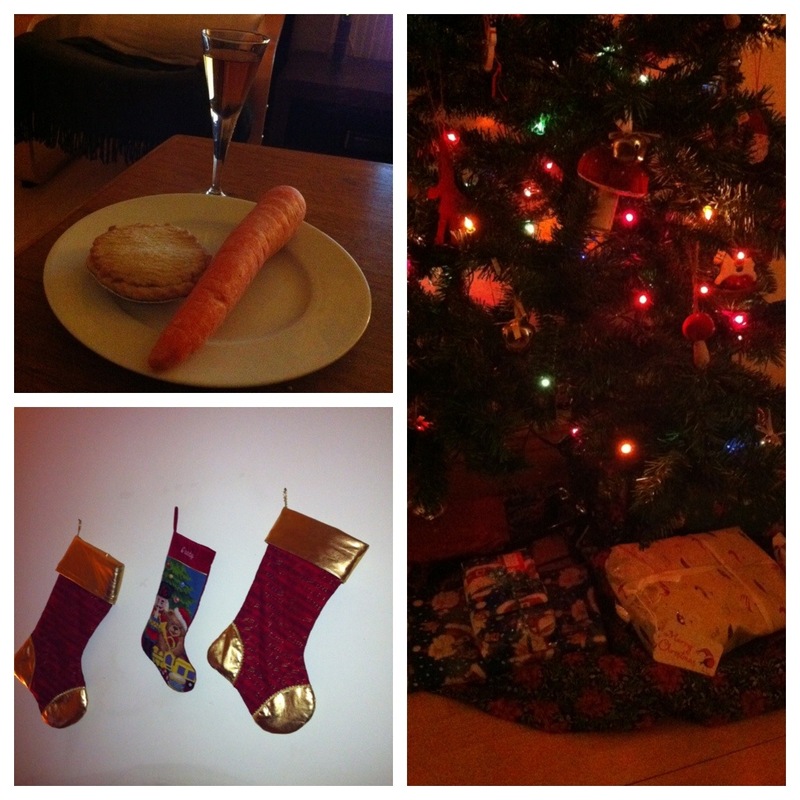 But I’m getting off the subject… this post is about Christmas and (X)boxing day. 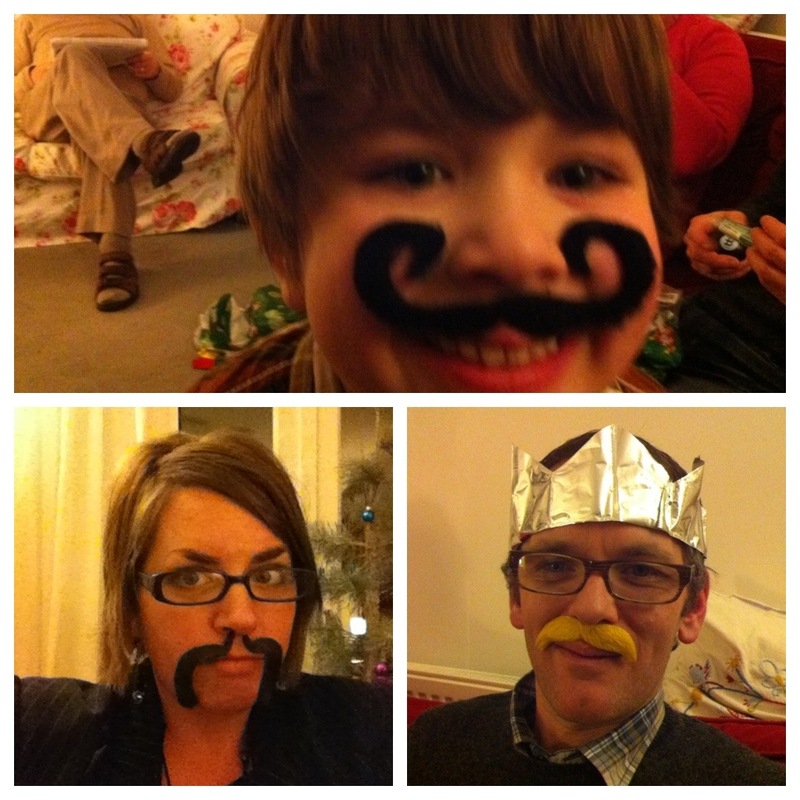 Our Christmas was a much more low key affair this year. 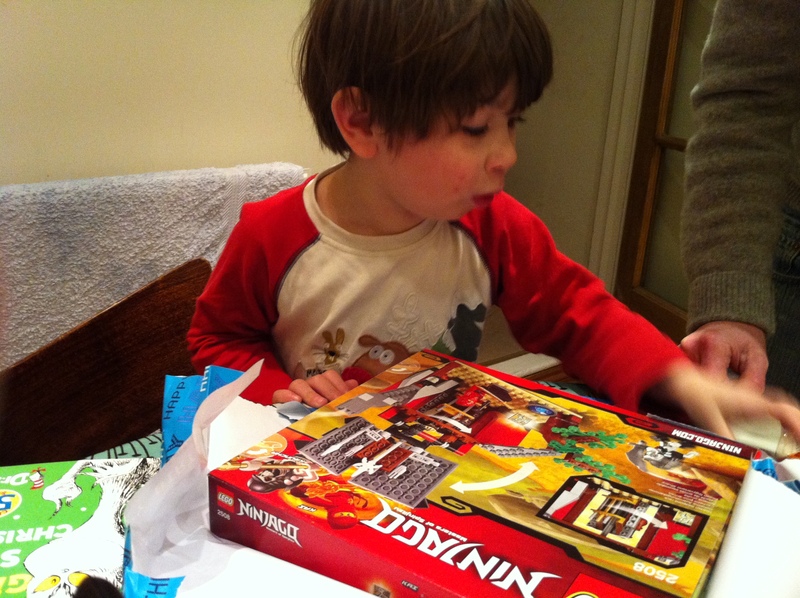 Mini G is now at that age where he ‘gets’ Christmas and since last year Martin and I were busy getting Christmas dinner prepared, we didn’t get to play with him. 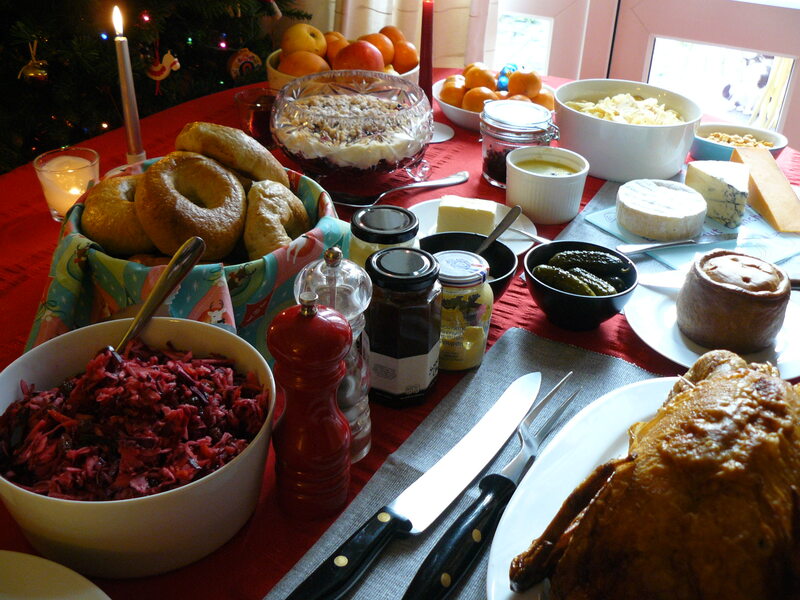 So this year, Christmas dinner was moved to the in-laws and we had a nice, relaxing and very playful morning. 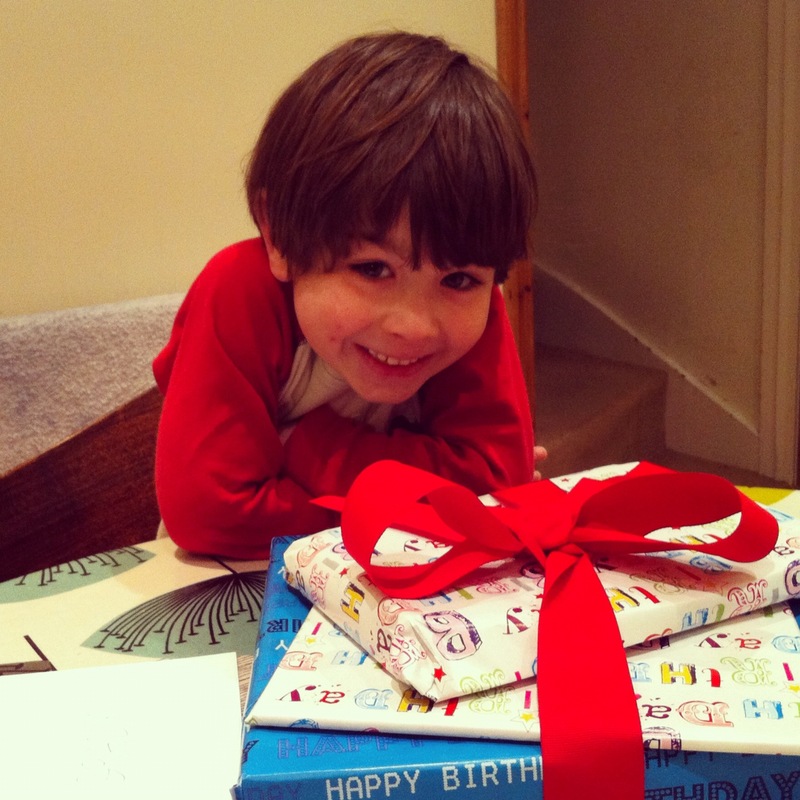 And playful evening – pass the parcel included. 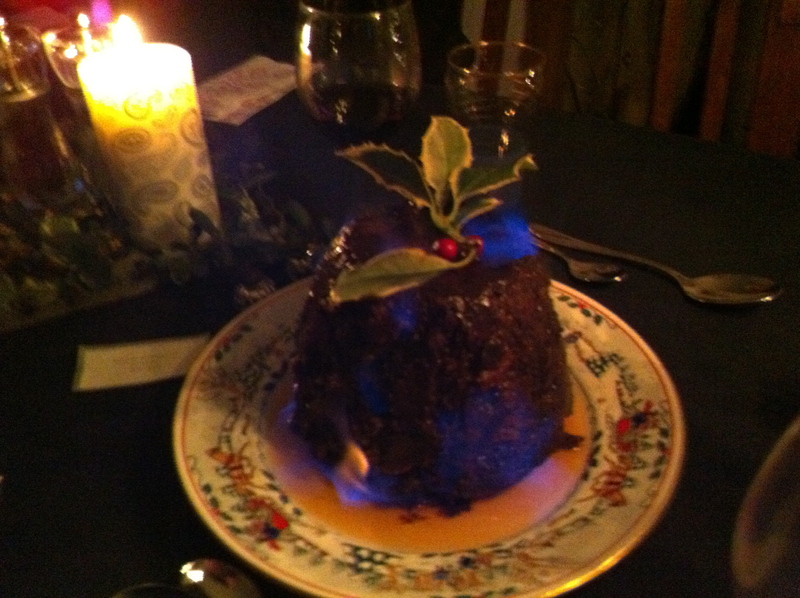 But the main attraction was the Christmas pudding made by MIL. Delicious and beautifully lit, if I do say so myself! To me Boxing Day is all about food, but ever since getting our Xbox 360 and kinect, I’d been imagining a house full of family where the kids are in the converted ‘game room’ playing Fruit Ninja or Kinectimals and the adults in the kitchen/dining/converted lounge hanging out and enjoying good food. 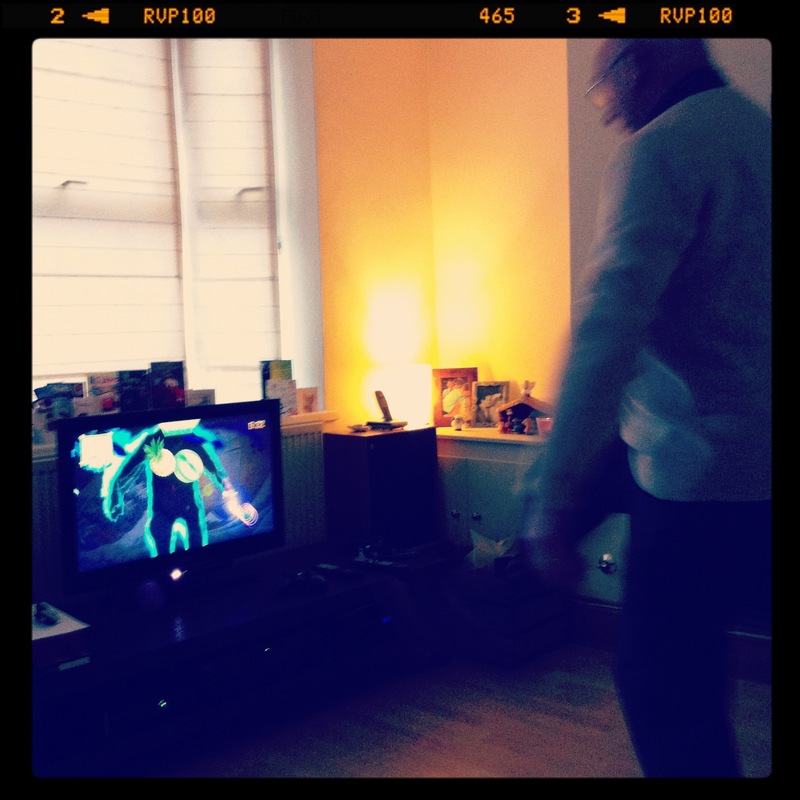 I thought Boxing Day would be the perfect opportunity, so I deemed 26th December ‘Xboxing Day’. And although certain family members were a little less responsive resulting in less kids than anticipated, we still had a fantastic time. 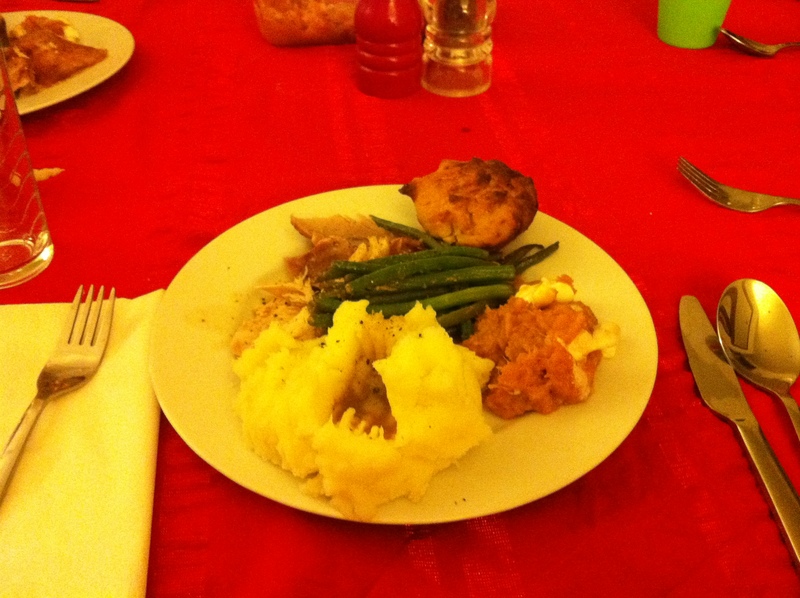 Our Boxing Day spread was more than a little awesome, if I do say so myself. 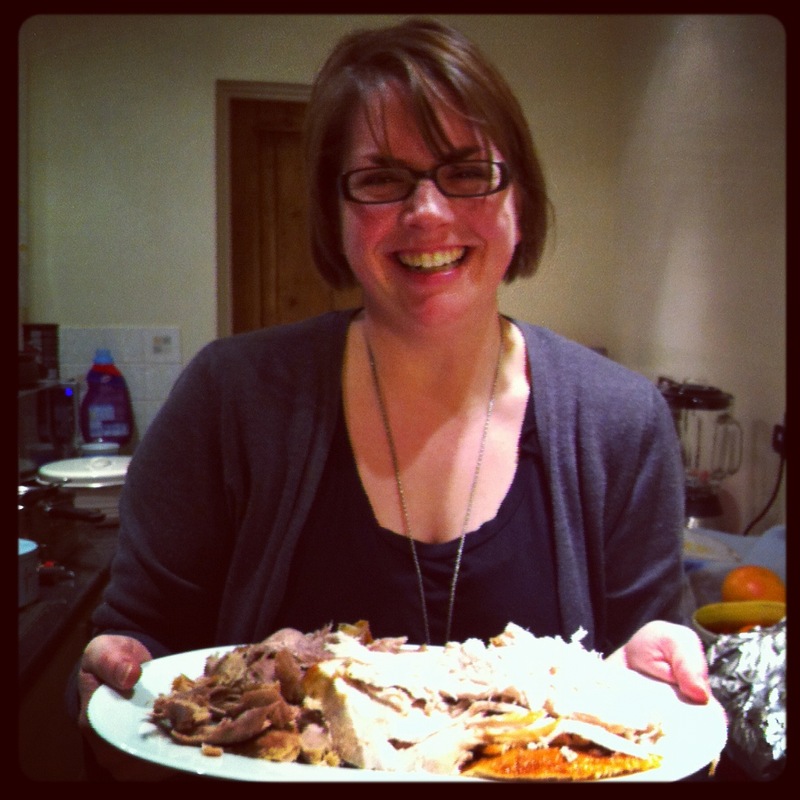 We had a whole roast ‘leftover’ Turkey, Autumnal Slaw from Leon’s book, chutneys, cheeses, homemade bagels courtesy of Nigella’s HTBADG, crisps, fruits, nuts and last but not least egg nog trifle from Eric Lanlard’s Home Bake. His book is featured on the blog quite a bit throughout this year and this one definitely is worthy of a highlight. 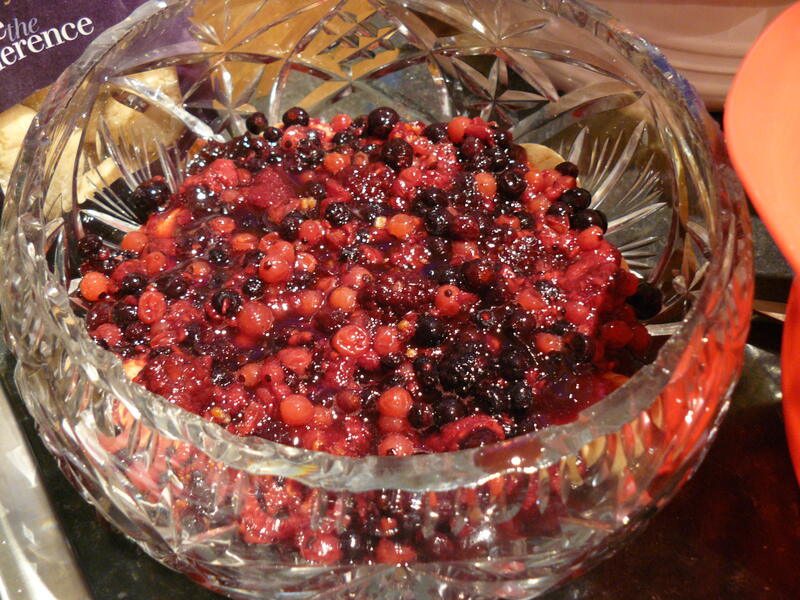 His recipe calls for fruit soaked in Grand Marnier, but I opted for Amaretto since I had it in the house. 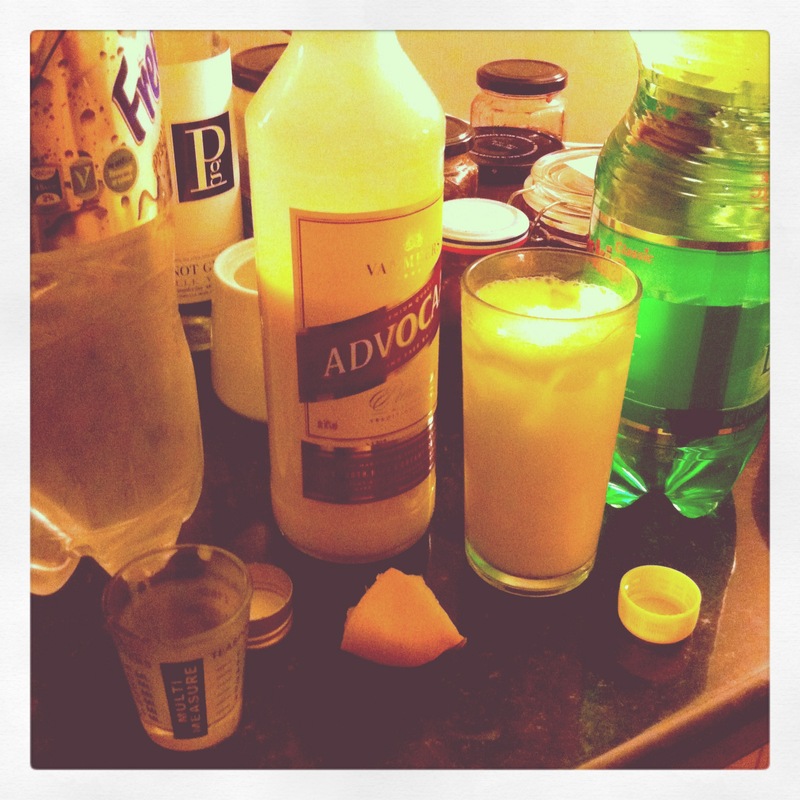 To create the egg nog custard, he used Advocaat. This gave me an excuse to add some to our liquor cabinet and also add ‘Snowballs’ to the menu for our day of Xboxing fun. The key to a good Snowball is 2 shots of Advocaat, 1/4 squeeze of lemon or lime juice shaken up with some ice and poured in a highball glass then topped with lemon-lime soda (Sprite/7up) or lemonade if you are from the UK. 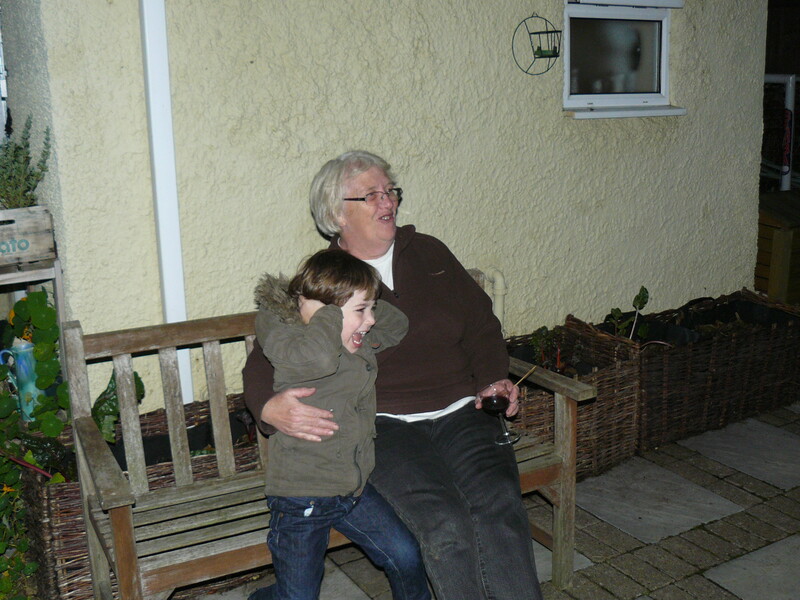 We even got Nanny & Poppy involved with the Xboxing Day activities. Poppy was a natural on Fruit Ninja. 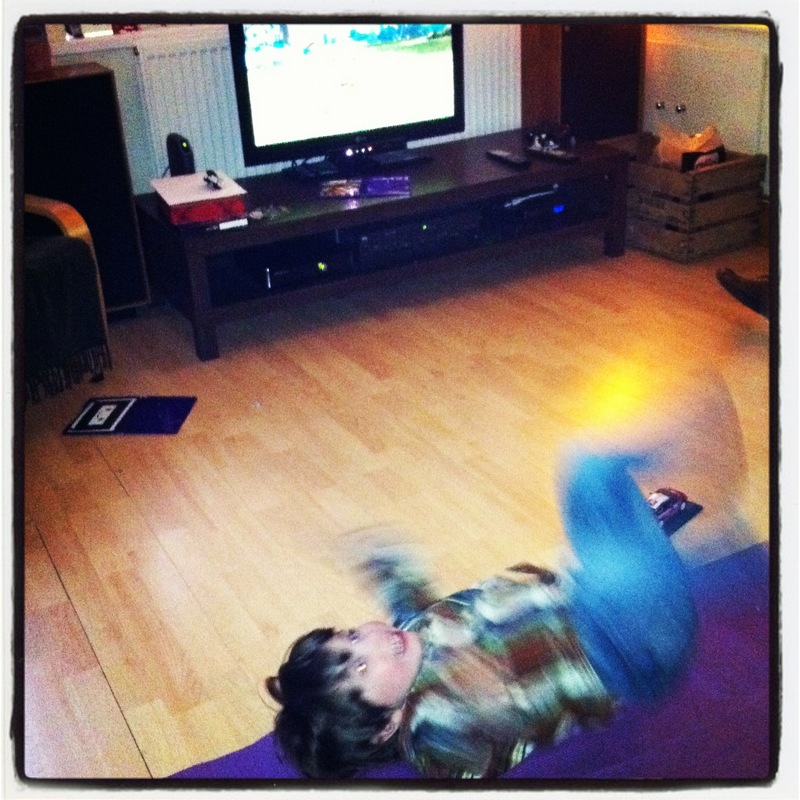 Mini G showed off his animal training skills on Kinectimals and I reigned supreme on XBox Trivial Pursuit. 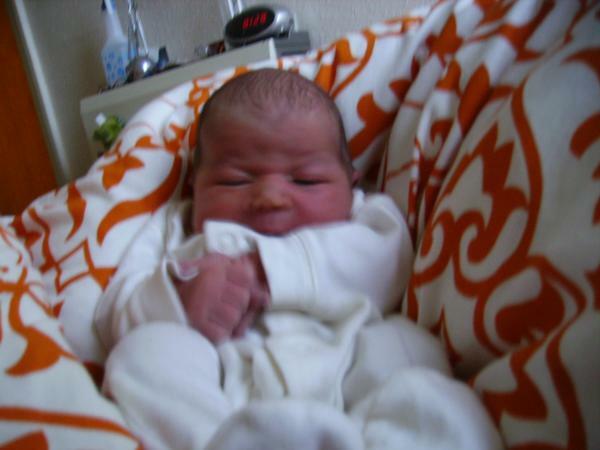 Five years ago… Happy birthday Mini G! Five years ago, Martin was making our favourite meal of grilled chicken tacos* while I watched Mission Impossible reruns on the TV. I heard a pop from inside my belly and our lives were never the same. Watching him grow over the past five years has been an incredible journey. He gets more and more clever each day. Sometimes it’s my own mission impossible and I can’t keep up! So, today is a very special day. 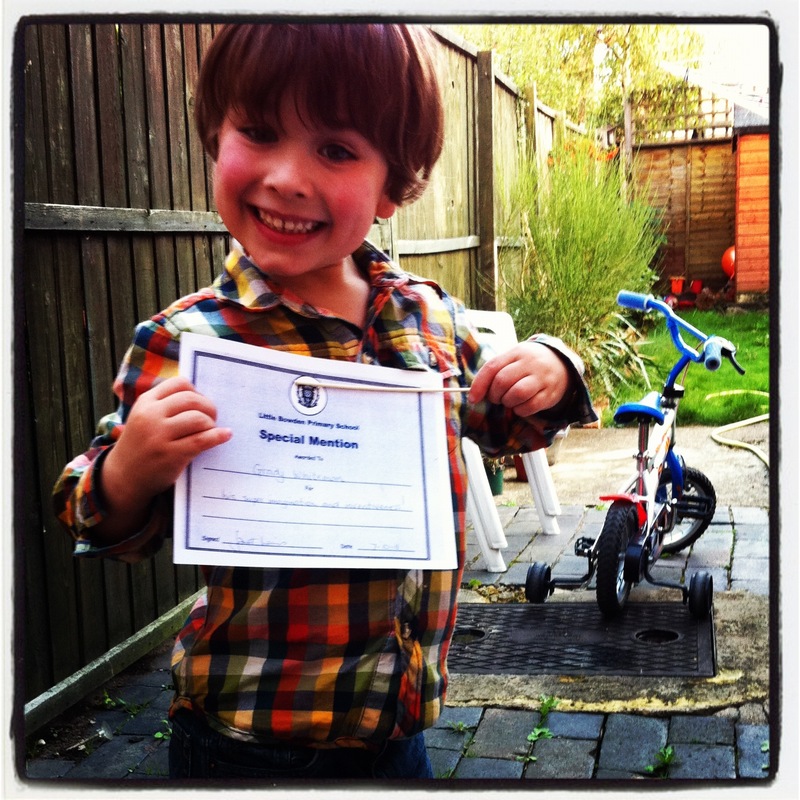 My baby grizzlin is no longer ‘baby grizzlin’, he’s ‘boy grizzlin’ turning five. Happy birthday, Grady Joe! 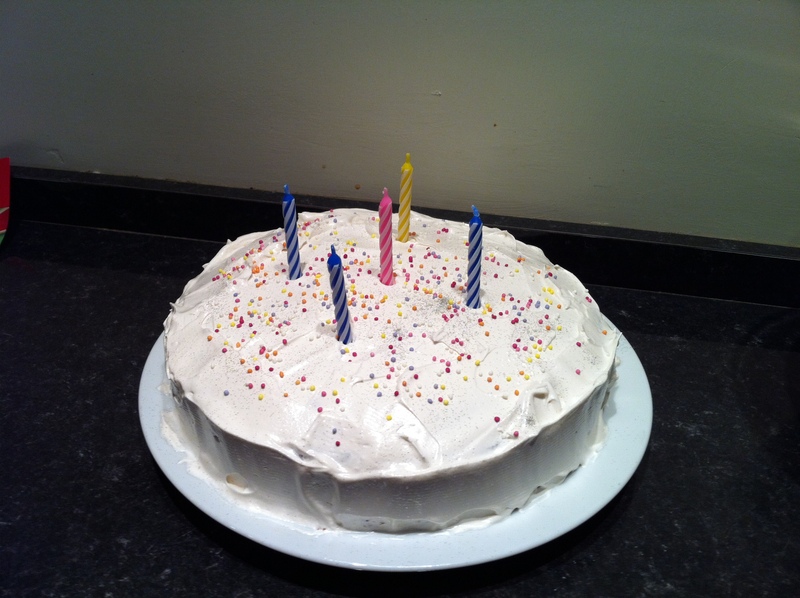 Tonight, we celebrate with hot dogs (sausages), chicken nuggets and lemon cake with marshmallow frosting! 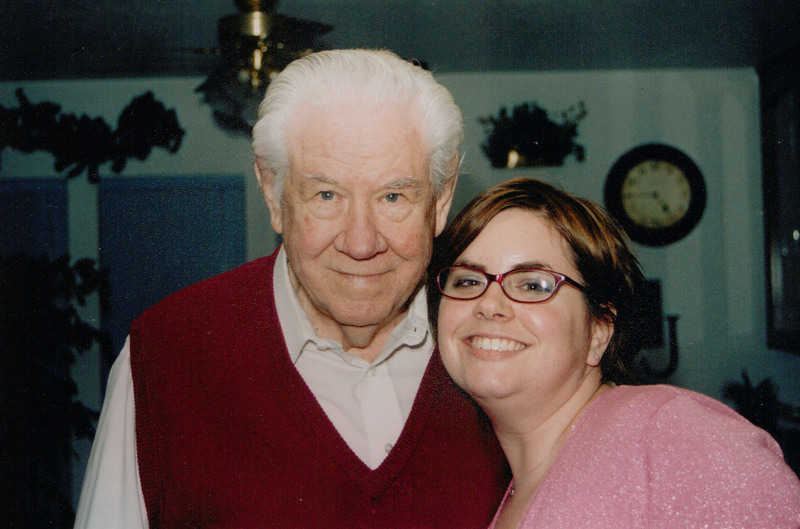 Also, happy birthday to my Papa Joe, whom I miss very very much. Since they share the same birthday, I made sure they shared the name. Having not celebrated Thanksgiving for seven years, I decided this year was time to make a change. I booked the day off work, invited some new friends around and set out to have Team Whiteman & Team Heaps first UK Thanksgiving feast. 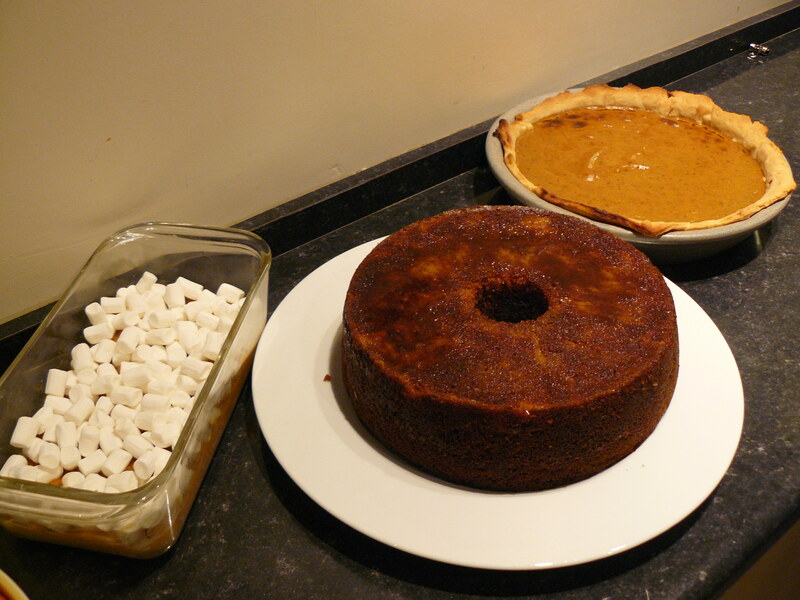 On the menu was, of course, turkey, candied yams, mashed potatoes, gravy, pumpkin pie and apple bourbon cake. Team Heaps brought corn pudding, green bean casserole (not the kind with cream of mushroom soup, though) and cinnamon ice cream. Needless to say, we were not going to go hungry. 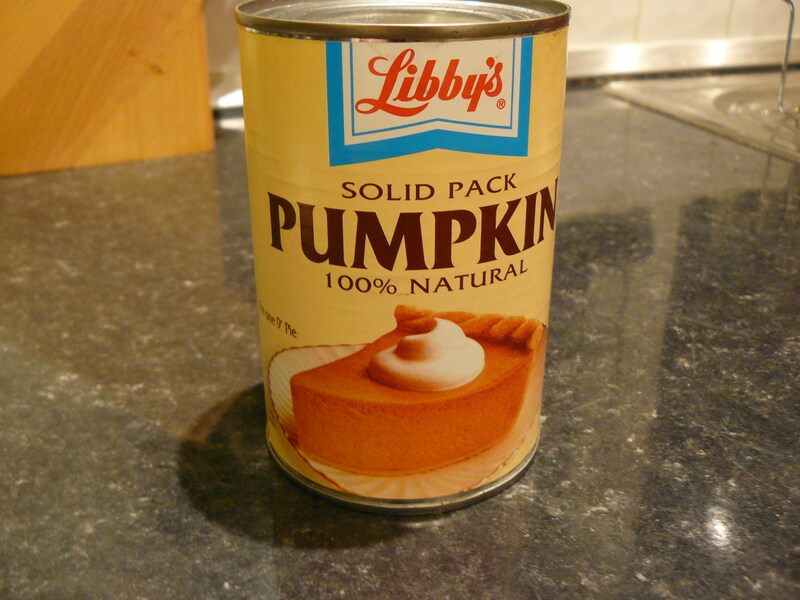 Pumpkin pie, a classic american dessert, is not as widely known here making it a bit difficult to find tinned pumpkin. Thankfully, Waitrose carries it. BAKE in preheated 425° F oven for 15 minutes. 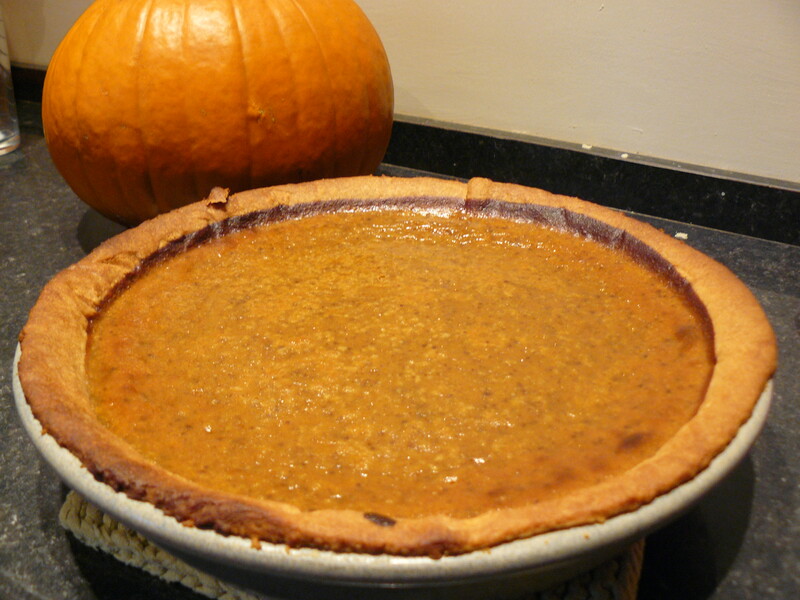 Reduce temperature to 176˚/350˚ F; bake for 40 to 50 minutes or until knife inserted near center comes out clean. Cool on wire rack for 2 hours. Serve immediately or refrigerate. 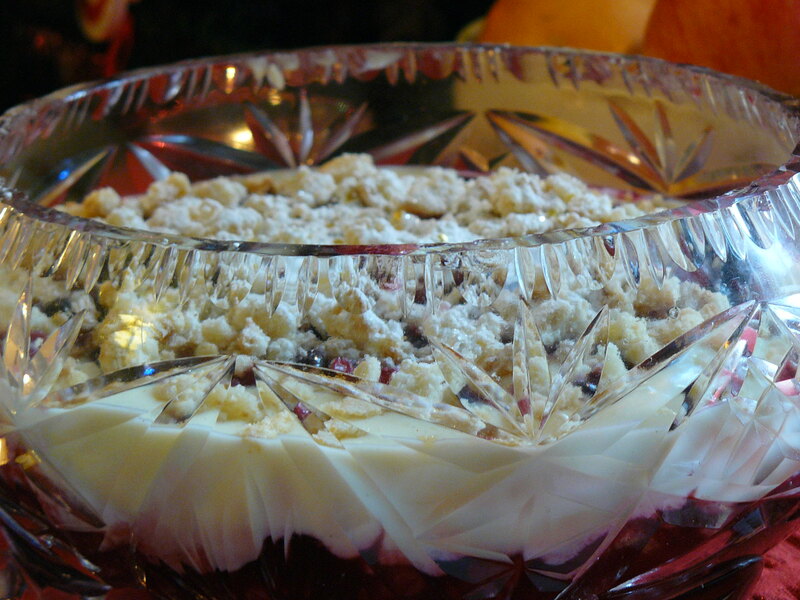 Top with whipped cream before serving. We had an abundance of apples, and although apple pie is traditionally served on Thanksgiving, I decided to get a bit fancy. 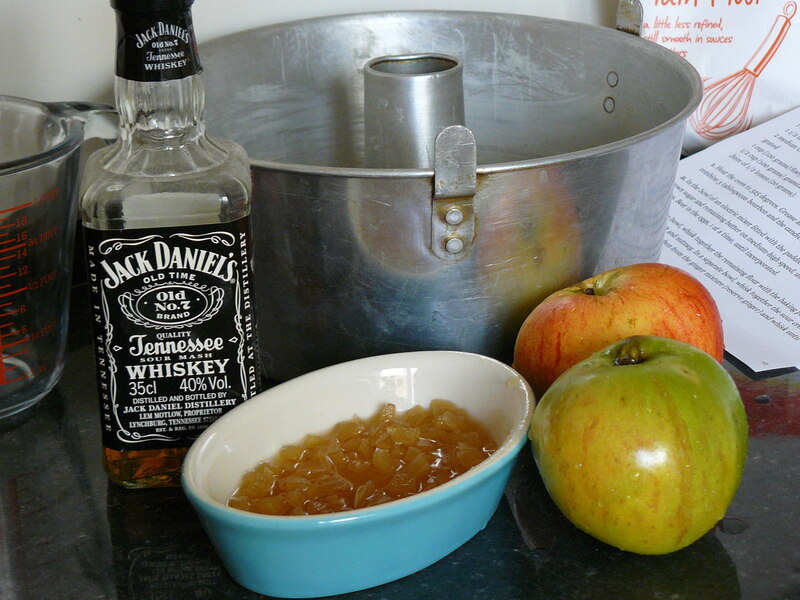 We had a surplus of Jack Daniels, so this recipe was a perfect choice. Juice of 1/2 lemon (20 grams). 1. Heat the oven to 325 degrees. Grease and flour a 12-cup bundt pan. In a small bowl, combine 3 tablespoons bourbon and the candied ginger. Let stand 10 minutes. 2. 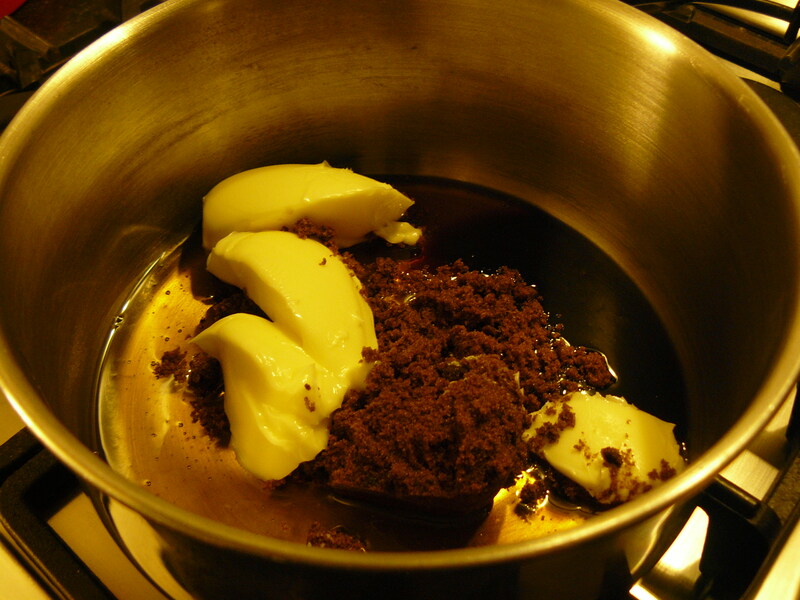 In the bowl of an electric mixer fitted with the paddle attachment, beat together the brown sugar and remaining butter on medium-high speed, until light and fluffy, about 5 minutes. Beat in the eggs, 1 at a time, until incorporated. 3. 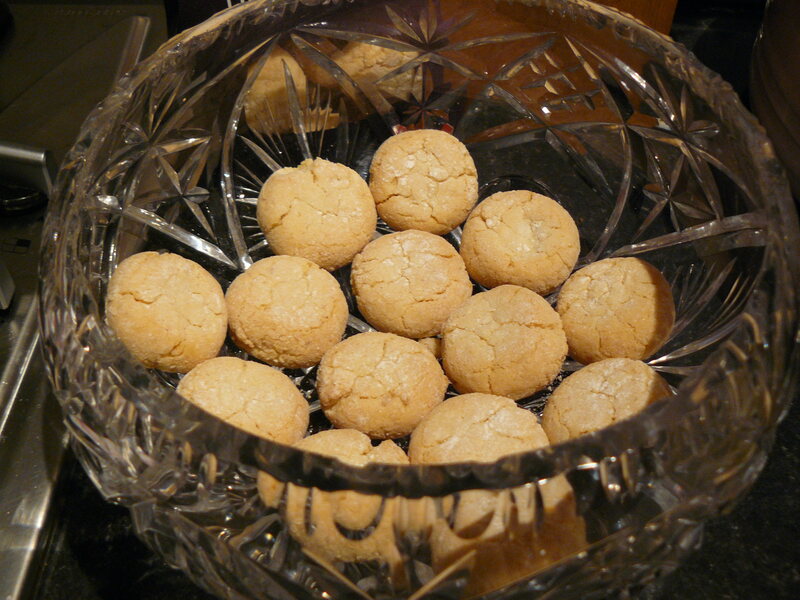 In a separate bowl, whisk together the remaining flour with the baking powder, baking soda, cinnamon, salt and nutmeg. 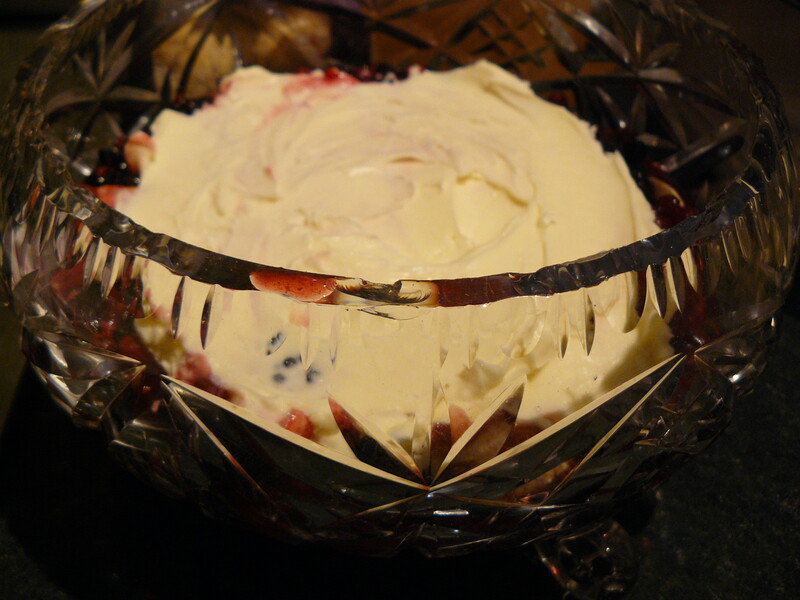 In a separate bowl, whisk together the sour cream and vanilla. Pour in the bourbon from the ginger mixture (reserve ginger) and whisk until smooth. Stir in zest. 4. With the mixer on medium speed, add the dry mixture and sour cream mixture to the wet mixture in three additions, alternating between the two. Fold in the ginger, apples and pecans. Scrape the batter into the prepared pan. Bake until the cake is golden brown and a skewer inserted into the cake comes out dry, about 1 hour 10 minutes. Cool in the pan 20 minutes, then run a paring knife around the sides of the pan to release the cake; cool, flat side down, on a wire rack. 5. 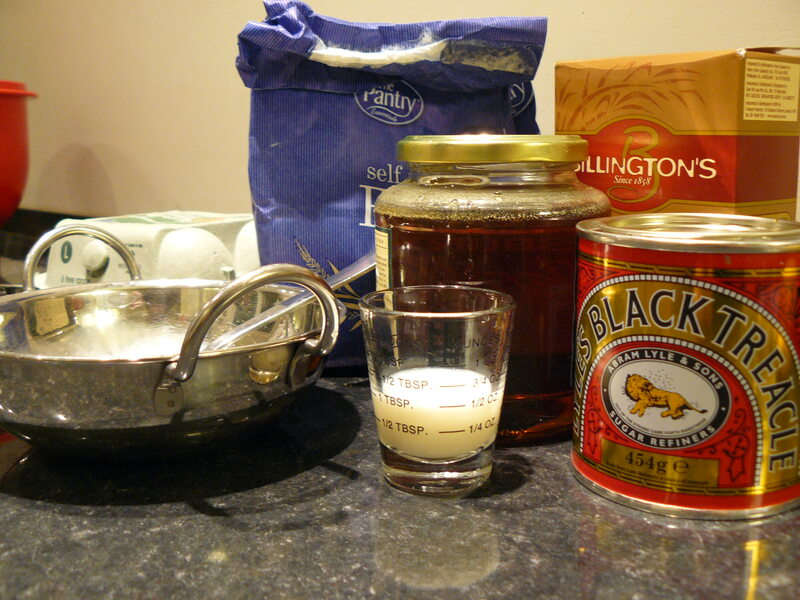 While the cake cools, combine the 1/2 cup granulated sugar and 1/2 cup whiskey in a small saucepan. Over low heat, gently stir until the sugar dissolves. Stir in the lemon juice and take off the heat. 6. While the cake cools, make 10 slits on top with a paring knife and pour half the bourbon-sugar mixture on the still-warm cake. 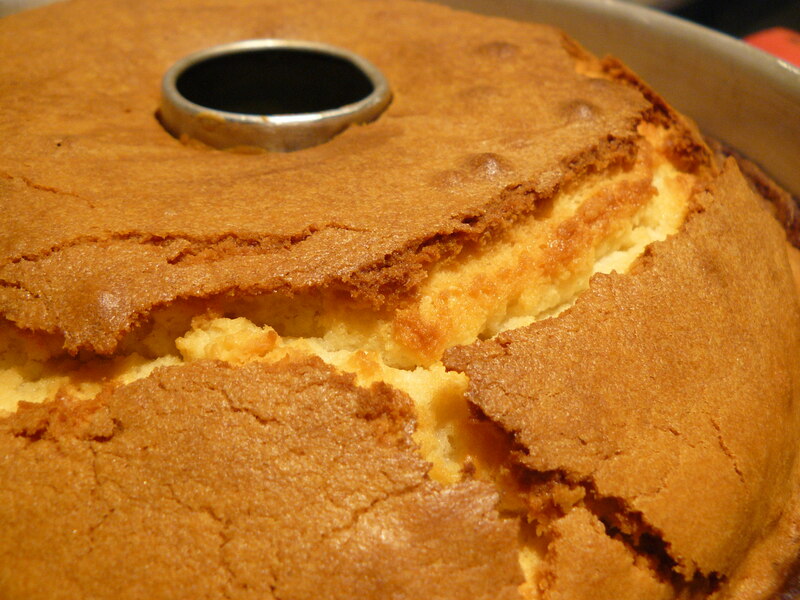 When the cake is fully cool, flip it and pour the rest of the glaze on the other side, then flip again to serve. Yield: 10 to 12 servings. 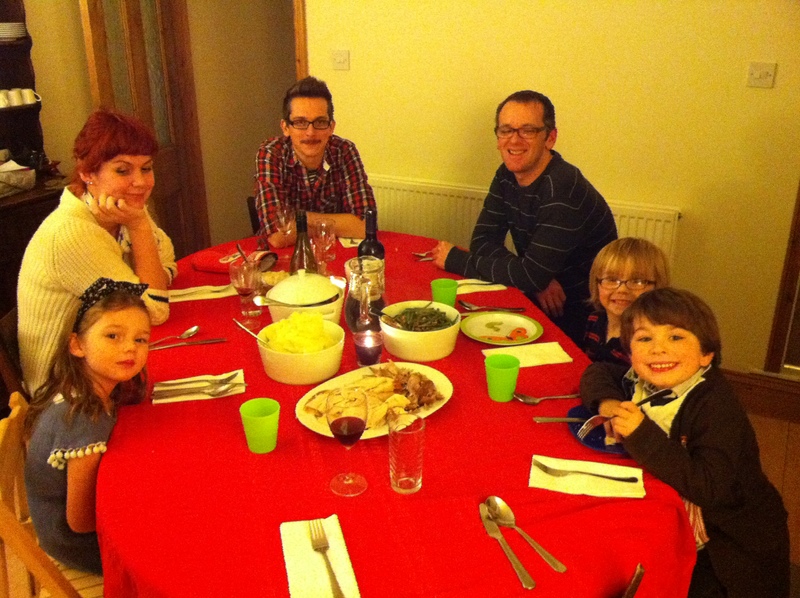 The first Team Whiteman/Team Heaps UK Thanksgiving was a success. I’ll definitely be looking to do this again in years to come. Now it is time to look forward as we countdown to Christmas. Bonfire night is an event, specific to England, to celebrate the failure to assassinate King James in 1605. Like a lot of observed ‘holidays’, the historical meaning gets lost, but the tradition still lives. 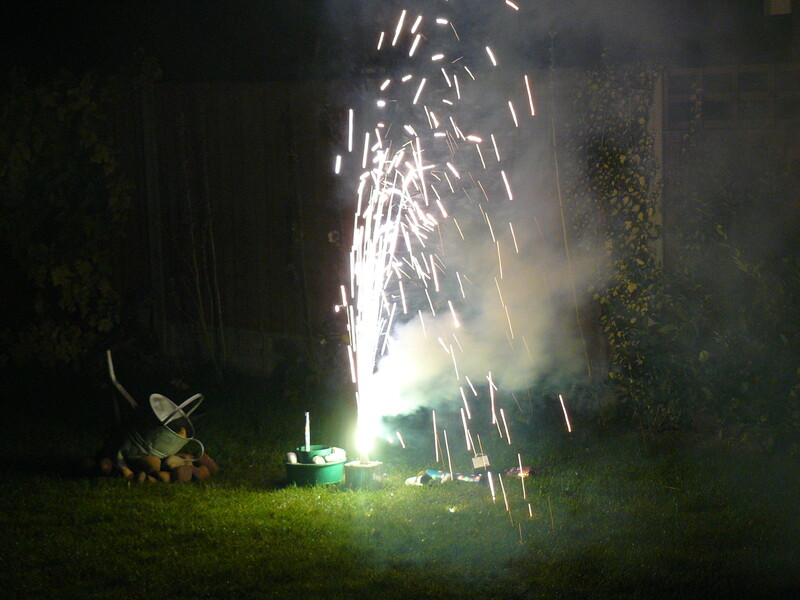 Families get together around a bonfire in the garden and let off fireworks or go to local fireworks displays, similar to how Americans celebrate 4th of July. 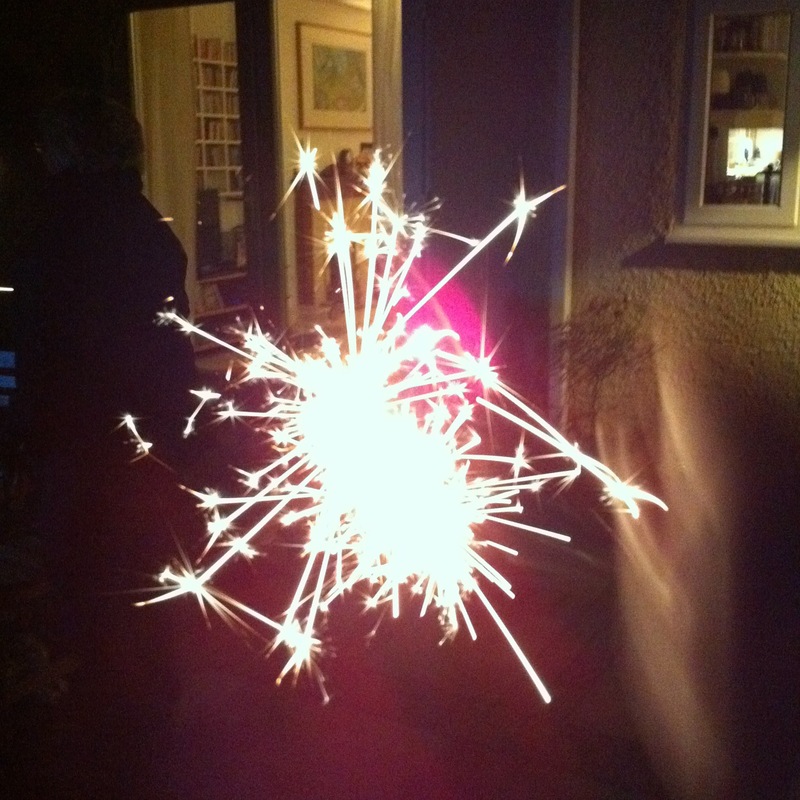 As an American expat, I much prefer bonfire night for a couple of reasons. Reason 1 – see earlier blog post. 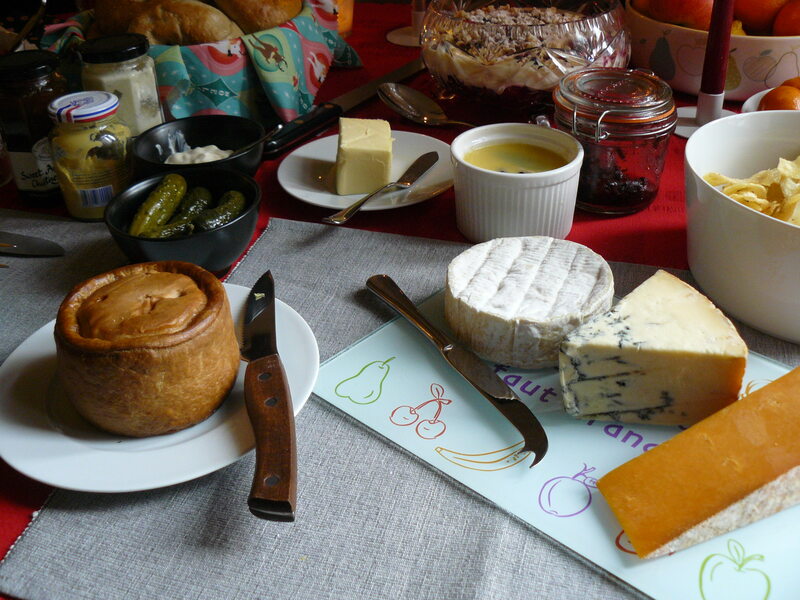 Reason(s) 2 – I love autumn, I love the crispness in the air, bundling up around a bonfire, and especially the traditional food involved. 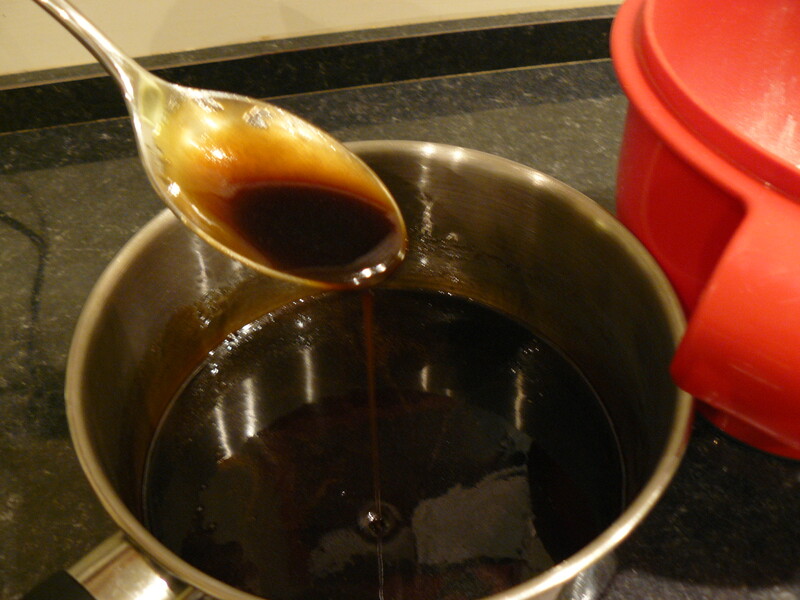 First weigh a saucepan on the scales, and weigh the syrup and treacle into it. Then add the margarine and the sugar to the saucepan and place it over a gentle heat until the margarine has melted down – don’t go away and leave it unattended, because for this you don’t want it to boil. 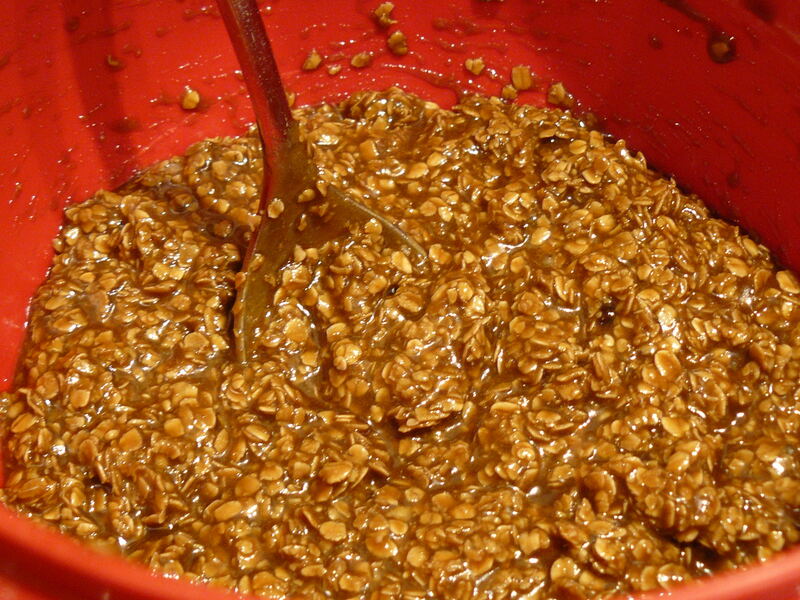 Meanwhile, measure the oatmeal, flour and ginger into a mixing bowl, add a pinch of salt, then gradually stir in the warmed syrup mixture till the mixture is all thoroughly blended. Next add the beaten egg, and lastly the milk. Now pour the mixture into the prepared tin and bake on the centre shelf of the oven for 1 hour 45 min. Then cool the parkin in the tin for 30 minutes before turning out. 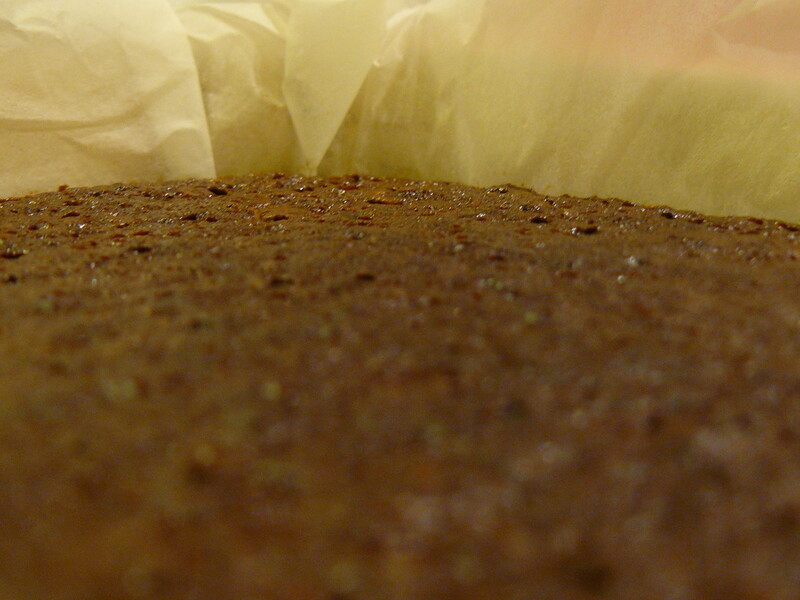 Parkin should be made a few days before it is intended to be eaten. This is one bonfire tradition I can get behind. 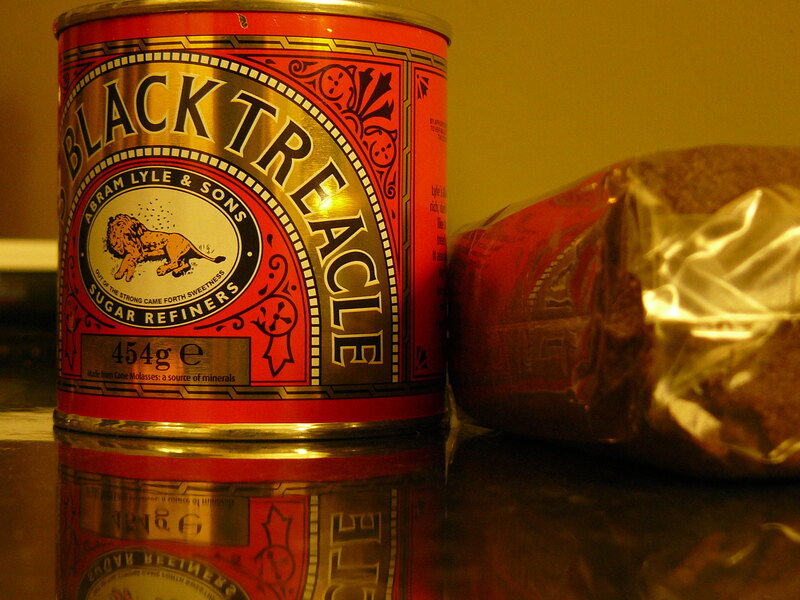 It is one tasty cake with flavours of dark treacle and ginger. Best served while sitting around a fire. S’mores are an American dessert traditionally eaten around a campfire. Since we have not yet gone camping, a bonfire is the closest thing. The origin of the s’more (short for Some More, because they are so good you always want some more) is unknown, however the first printed recipe dates back to 1927 from ‘Tramping and Trailing with the Girl Scouts’ by Loretta Scott Crew. There are three simple ingredients in a S’more – marshmallow, chocolate and graham crackers. Graham crackers are not native to the UK, so I used digestive biscuits as a substitution. Desperate times call for desperate measures… it works. 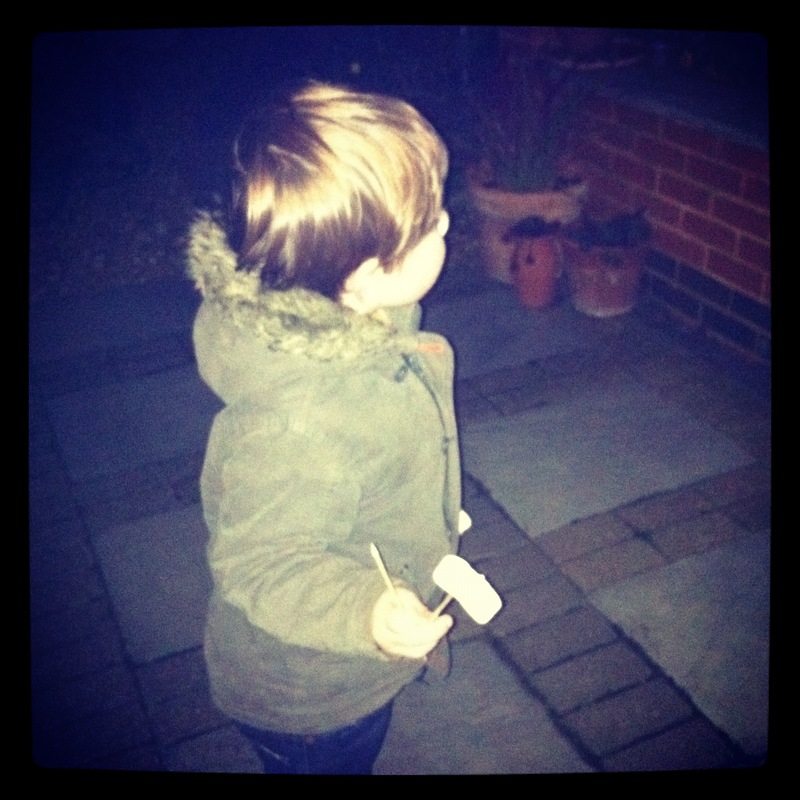 Step one – take a large marshmallow, place on the end of a long stick – we used bamboo skewers – then place the marshmallow dangerously close to the flames of the bonfire. 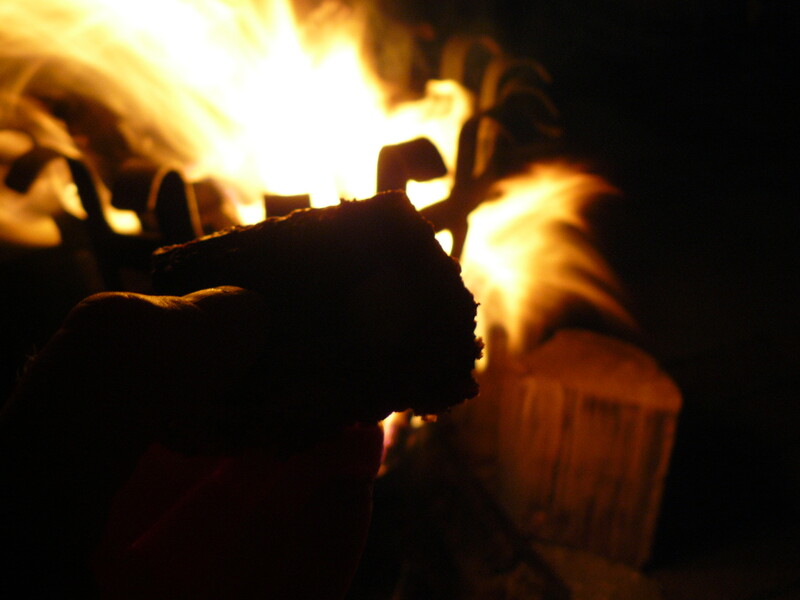 It’s ok if the marshmallow catches fire, just blow it out – it adds to the experience/flavour. 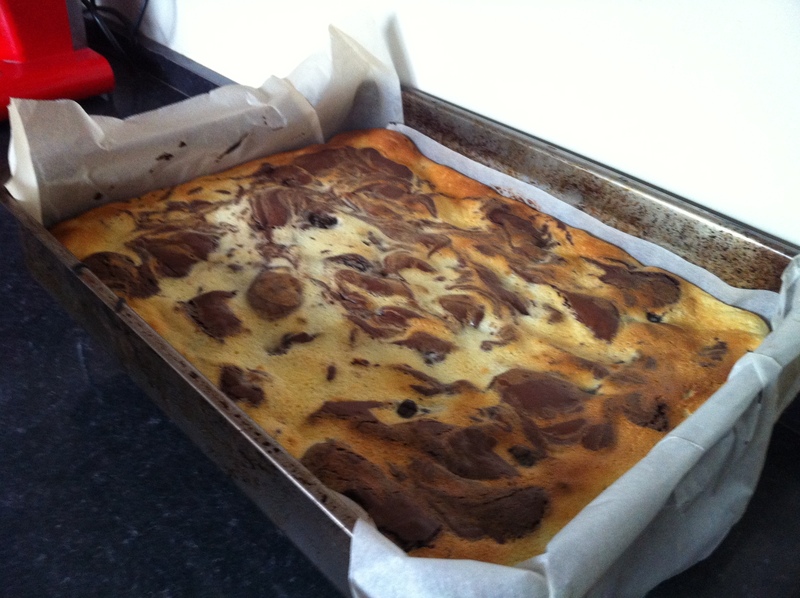 Step two – take a digestive biscuit and place a piece of chocolate on it. The best sort of chocolate would be the flattest bar you can find. Hersheys is traditional to the US, but Sainsburys own will work fine too. Step three – place the marshmallow – still on the skewer – on top of the chocolate piece and digestive biscuit. 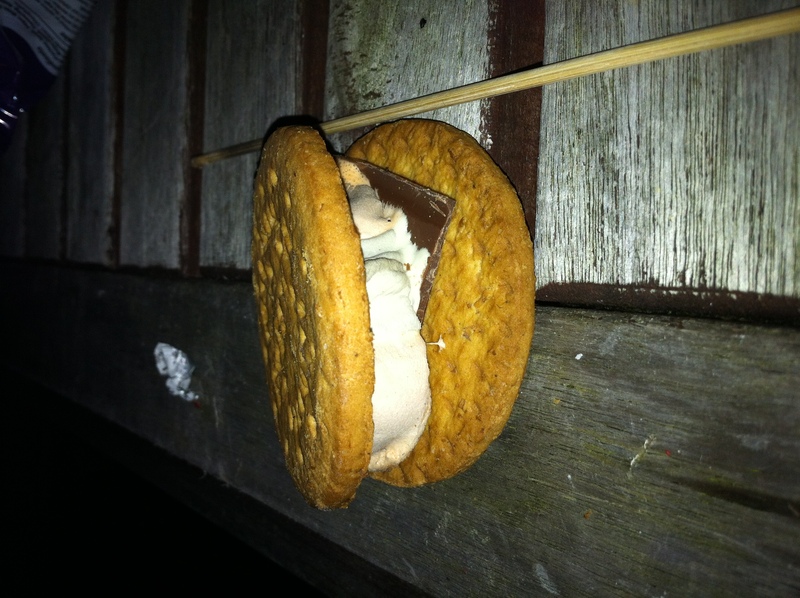 Then place a second digestive biscuit on top of the marshmallow creating a marshmallow and chocolate sandwich. Gently remove skewer, stick (whatever you might be using). 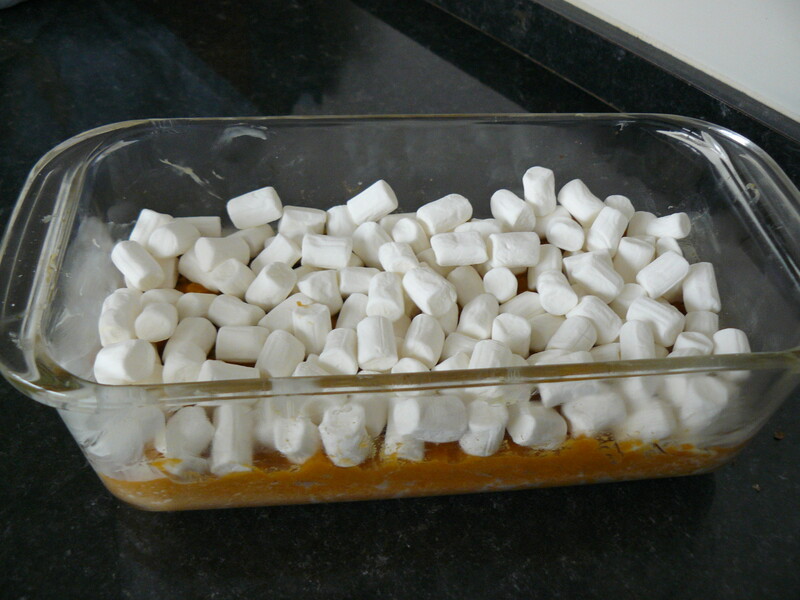 Step four – squash a bit so that the marshmallow goes a bit oozey, then put it in your mouth and eat it. These were a hit with the fam. 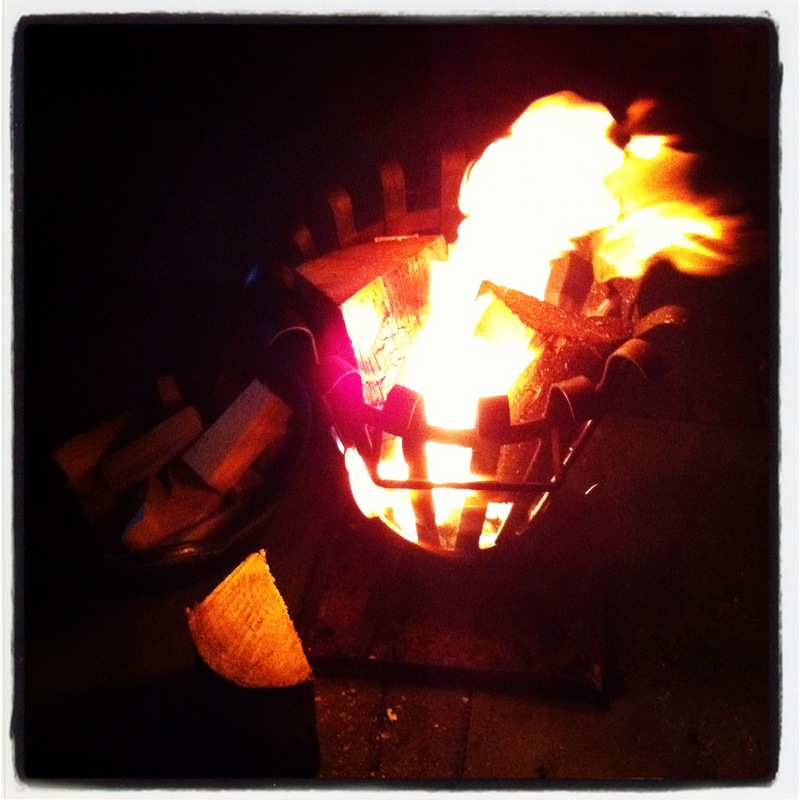 The rest of the evening was spent burning things, as you do on bonfire night. 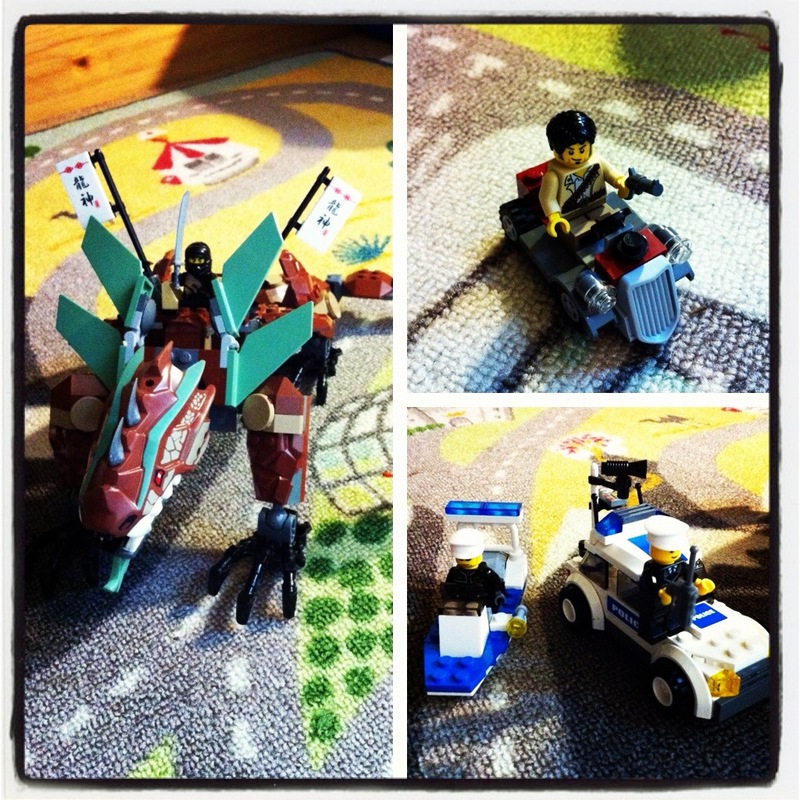 Fun for the whole family…I love bonfire night.